WASHINGTON (CNN) -- The Obama administration will ask Congress for another $83.4 billion to fund the wars in Iraq and Afghanistan through the end of September, Democratic congressional sources said Thursday. President Obama's spending measure is likely to be the last supplemental request submitted to pay for the wars. The request is expected to pay for those conflicts for the rest of the 2009 budget year, two Democratic congressional sources said. The money would bring the running tab for both conflicts to about $947 billion, according to figures from the Congressional Research Service. More than three-quarters of the $864 billion appropriated so far has gone to the war in Iraq, the agency estimated. Since taking office in January, President Obama has announced plans to shift troops out of Iraq and beef up U.S. forces in Afghanistan, where American troops have been battling al Qaeda and Taliban fighters since al Qaeda's 2001 attacks. In a letter to House Speaker Nancy Pelosi, Obama said the situation in Afghanistan and neighboring Pakistan "demands urgent attention." "The Taliban is resurgent, and al Qaeda threatens America from its safe haven along the Afghan-Pakistan border," Obama wrote in submitting the funding request. "There is no question of the resolve of our military women and men. 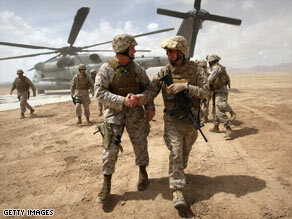 Yet, in Afghanistan, that resolve has not been matched by a comprehensive strategy and sufficient resources," Obama wrote. About $75 billion of the latest request would pay for military operations, including $9.8 billion for body armor and protective vehicles and $11.6 billion to replace worn-out equipment. The rest would go to diplomatic programs and development aid -- including $1.6 billion for Afghanistan, $1.4 billion for Pakistan and $700 million for Iraq. The request would also provide about $800 million for the Palestinian Authority, including humanitarian aid for Gaza, the Hamas-ruled territory that was heavily bombarded by Israel in December and January; $800 million to support U.N. peacekeeping missions in Africa; and $30 million to the Department of Justice to manage the closure of the U.S. prison camp at Guantanamo Bay, Cuba. The supplemental spending bill is likely to be the last such request submitted to Congress to pay for the wars, White House spokesman Robert Gibbs said. While the Bush administration relied on supplemental spending bills to fund the conflicts, Obama began including war spending in his 2010 budget. The president urged Congress to move quickly on the request "and not to use the supplemental to pursue unnecessary spending." But Rep. Lynn Woolsey, a prominent anti-war Democrat, said the requested funding would "prolong our occupation of Iraq through at least the end of 2011," when U.S. troops are scheduled to leave the country, "and it will deepen and expand our military presence in Afghanistan indefinitely." "Instead of attempting to find military solutions to the problems we face in Iraq and Afghanistan, President Obama must fundamentally change the mission in both countries to focus on promoting reconciliation, economic development, humanitarian aid, and regional diplomatic efforts."